Vanessa Craven, of Welsh-Indian background, is an Australian singer songwriter and multi-instrumentalist. She has been passionate about guitar playing since her early teens in India. Immigrating to Australia from the Himalaya Mountains ,she studied theology, served in the Australian Army Reserve, served as a volunteer with the police search and rescue, worked as a librarian, having completed her qualifications in India, and played music as a hobby. She is also a keen hobby photographer.Since 2009 she has played her music in a variety of events and venues such as the Denny Roots and Blues Festival R.S.L.,Deniliquin, Newstead Folk Festival, Castlemaine Fringe Festival, Daylesford Folk and Blues Festsival, Ballan Autumn Festival, Maldon Festival, Brunswick Festival, Daylesford Inn, Babushka Bar, Ballarat, Wesley Anne, Northcote, The Aireys Pub, Aireys Inlet, Bridge Hotel, Castlemaine, Newport R.S.L., Newport, Gallery on Sturt, Ballarat (Art & Music event), Black Hill Gallery, Ballarat, East Malvern RSL Entertainers Club, and many more venues including bars, aged care facilities. She moved to Daylesford permanently in 2009 and being passionate about living in an Eco-friendly environment, she built a rammed earth house. She has contributed to the Daylesford Community, by organising and running the Daylesford Folk and Blues Festival from 2010 through to 2013 and also ran an Open Mic at venues such as The Daylesford Inn, Seior Citizen’s Hall and Buffalo Girls Cafe. Vanessa is attracted to folk,blues,jazz and alt-country styles of music and continues to explore other genres as well.These influences are reflected in her performances. Her music has been influenced by listening to classical music with her father when she was a child, and more recently by Bob Dylan, Ry Cooder, Jerry Douglas, Kristina Olsen,Nick Charles, Pete Fidler, The Beatles, Chris Smither, Bob Brozman, Harry Manx, Kate Campbell, Janis Ian, Debashish Bhattacharia, Eric Bogle, Glen Cardier to name a few. She currently plays guitar y in Open G and Open D (DADF#AD), droped D, as well as standard tuning. She also surprises listeners, by throwing in a touch of didgeridoo in some songs in order to add atmosphere and colour to her music. 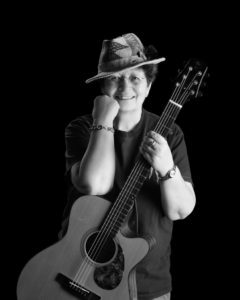 Vanessa is currently performing as a ‘one woman band’ and plays lap slide, guitar, Cajon drum, harmonica and didgeridoo, with an overlay of smooth easy listening vocals. She is a multi-instrumentalist and plays the cajon drum, floor tambourine, harmonica, didgeridoo and guitar. She is also involved in playing as a duo in Sugar ‘n Spice and also in her band called Lunar Dust. In 2019 the 3rd. CD “Home Brew”. 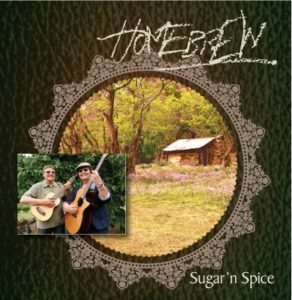 The entire CD being performed by the duo ‘Sugar ‘n Spice. It is in the process of being launched! Currently the CD is available from the artists directly. It will soon be available on iTunes, CD Baby, Trad and Now/Ducks Crossing and Amazon. In 2016 her 2nd. E.P “Forbidden Dance” recorded with the band Lunar Dust became available in July 2016. Its first launch was at the Newport Folk Festival. There after at Blue Bean Love Cafe, Hepburn, Daylesford Cidery, Farouks Olive, Ballarat Public Library and Trentham Library. Trad and Now / Ducks Crossing http://www.tradandnow.com/ . Credit cards accepted. 2014 – Sugar ‘n Spice duo (Vanessa and Zdena) combined to play under this name. Zdena on uke bass accompanying Vanessa. Also, the ‘band’ Lunar Dust – officially received its name. The band has played over the years together at the venues listed above, and some have played on the CD “Filtered Light”, Vanessa’s debut album. The band members comprise of : Vanessa Craven – vocals,guitar,lap slide,harmonica, didge and cajon drum, George Condos – latin guitar and udu, Don Gula – double bass and guitar, Andrew Barcham – banjo, Paul Jonas – violin, Peter Vadiveloo – percussion, and Suzanne Coutanceau harmony vocals, keyboard and melodica. 2014 Vanessa enrolled at the Australian Institute of Music, Melbourne Campus to perfect her skills in musicianship. Also “You’re Leaving” placed in the top 30 ASA Awards 2016 in the Open Category and “Forbidden Dance” also placed in the top 30 in the International Category before making it into the top 10. 2012 : Her original tunes “One Last Shot” and “Russian Caravan Tea” are in the top 25 in the current Australian Songwriting Association competition. 2011: Her original music has also been in the finals of the Maldon and Brunswick Music Festivals. 2010, 2012 & 2013 Winner in the Busking Competition – Kyneton Daffodil Festival . She has played as support act to Tiffany Eckhart and Dave Steel, Pete Fidler and Bill Jackson, and Suzette Herft. 2010 she was support act to Tiffany Eckhart, Dave Steel, Pete Fidler, Bill Jackson and Suzette Herft.